After flying from Southampton, across enemy-occupied France and the Mediterranean to Egypt, then on to India, Alexander arrived in Burma on 5 March—too late to prevent the fall of Rangoon a few days later. It soon became clear to Alexander that, with the forces available, he could only slow the Japanese advance. He could not stop it. British forces began their slow withdrawal, defeated by an enemy that was not superior in numbers but was was well-trained and well-equipped in jungle warfare. It was also clear to Alexander that he could not be both Commander-in-Chief Burma and command the front line forces that were directly opposing the Japanese. He summoned Major-General William Slim from India to fulfil the latter role. 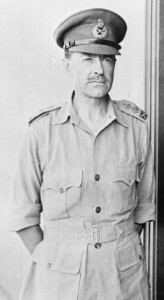 Slim arrived in Burma this week in the war, on 19 March 1942. 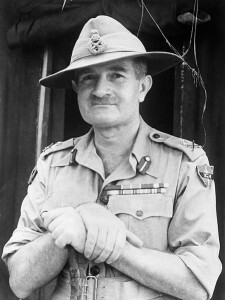 The two divisions available to the British, namely the 17th Indian Infantry Division and the Burma 1st Division, were combined into a corps—the Burma Corps—and Slim was put in command. He was promoted to Lieutenant-General two months later. Slim would command his corps during its withdrawal to India and would be appointed commander of a newly formed Fourteenth Army that was charged with reconquering Burma. The campaign would last until May 1945. Slim’s tactics of using jungle trails (as the Japanese were trained to do) instead of roads and of supplying front line and surrounded troops by air would prove decisive. This entry was posted in World War II and tagged Burma, Harold Alexander, Walter Model, William Slim. Bookmark the permalink.